Adobe flash player is a must have application if you want to browse we with happiness (I hope it won’t be the case after few years), either on Linux Mint (version 12 released few days ago) or Windows or Mac (because more than 50% pages have some sort of flash content, you need adobe flash for playing video on your favorite websites such as YouTube). Linux Mint 12 (Lisa) have firefox web browser installed by default – so if you are browsing web with firefox then you might got stuck on youtube page. Adobe flash player or similar must have applications/plugins/codecs can not be shipped with Linux distribution ISO because of License compatibility problem (Ubuntu or Linux Mint uses GPL which doesn’t allow them to ship proprietary component along with the main packages). Anyway, if you want to install adobe flash in Linux Mint then you can either install it along with some other necessary plugins/codecs just by installing ubuntu-restricted-extras package or just the adobe from Software Manager (very similar to Ubuntu Software Center in Ubuntu). Now, In Ubuntu 11.10, you can also install the proprietary plugins during the installation procedure (but internet connection is required during installation). Anyway, after a fresh installation of Ubuntu 11.10 (Oneiric Ocelot) – adobe flash is a must required application -because a lot of website has flash content, and adobe flash player has better performance than others. Although, the world is moving towards flash-less web i.e the HTML5 will probably replace the flash players completely, within a couple of years but if we think about the present then the performance of Flash is better than what HTML 5 is promising, and the cross-browser implementation is not so easy. Ubuntu 11.10 (currently beta version is out! but the stable is coming soon before the mid Oct) has added a lot of new applications/packages in Ubuntu Software Center. 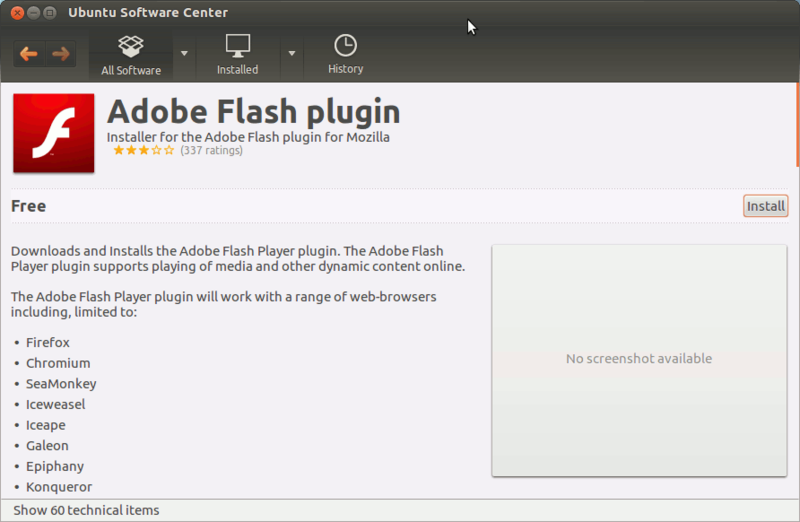 So you can also install the adobe flash player from there. Google Chrome already have flash player – installed by default so basically we need adobe flash plugin for Mozilla Firefox, SeaMonkey or others. 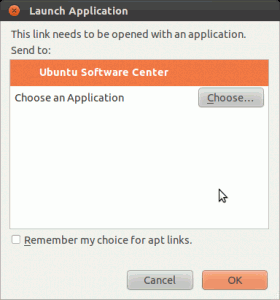 #2 : Now, a new window will open for handling PT -links select Ubuntu Software Center to open. #3 : Then click on install in Ubuntu Software Center – and wait until the installation is complete. Restart your web browser and you are Done! Adobe Reader (Formerly known as Acrobat Reader) is one of the most popular pdf reader. Adobe Reader is a freeware Application developed and maintained by Adobe Systems. Adobe Reader is primarily used in the reading and printing PDF (portable document format) Files (Although it as some pdf creation functionality, but it can be neglected in general). Ubuntu 11.04 (alias : Natty Narwhal) has ‘Document Viewer’ installed by default, which is sufficient for viewing pdf documents or ebooks. But it’s a very basic application, so it doesn’t have any advanced features. That’s why you want to go for some third party PDF readers like Adobe Reader or Foxit Reader. Here I’ll explain about Adobe PDF Reader. 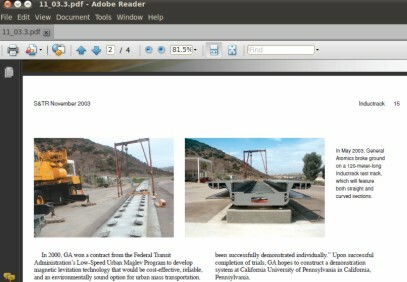 Adobe reader has improved its user interface, now it’s much simple to use and navigate. The application startup time has also been reduced and some security features has been integrated in the latest version. The overall performance has improved. #1 : First, open synaptic package manager and click on Settings -> Repositories -> Other Software and check all the boxes (basically two upper boxes, because rest of them would be already checked) to add those software sources. #2 : Now,click on Reload button, to update package information in the repository. 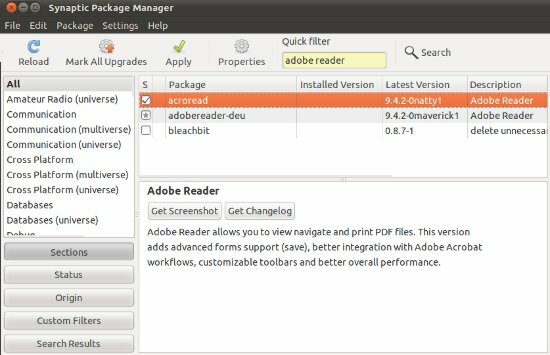 #3 : Then search for ‘adobe reader’ and select the packages, you want to install, then click on Apply button to begin the installation procedure, wait until the installation is completed. #4 : That’s All..you are done! Open it from the Main Menu and you can stuck it to the left icon panel (Right click on icon and select ‘Keep in Launcher’). Ubuntu 11.04 (alias : Natty Narwhal ) has got new Desktop – Unity ; Although you can switch to classic GNOME Desktop from the login menu, if you want (for any reason – may be you don’t like the Unity desktop or your computer doesn’t support the 3D effects in unity), but it’s not recommended, give it a try you might like it. All other features are almost same, so as usual – Ubuntu 11.04 doesn’t include some basics softwares and libraries by default, due to licensing problem (just relax you don’t have to worry about that). Ubuntu Software Center has ratings/reviews and comments, so it will be very helpful in choosing/installing applications. Banshee is the default media player and Firefox 4, the default Web Browser. The left icon bar , is pretty good for launching favorite apps quickly. That’s enough about Ubuntu 11.04! 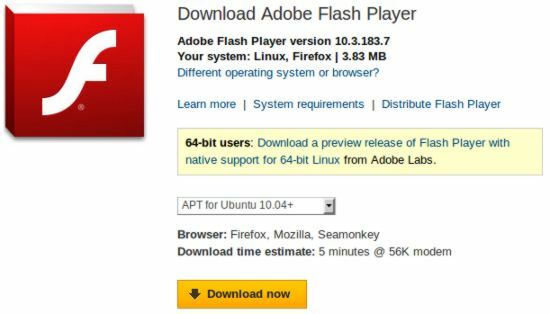 Let’s come to our point – how to install adobe flash player on Ubuntu 11.04, because you want to surf Internet (having more than 60% websites, with Flash content), and of-course a flash player is required. That’s where the adobe flash player comes in the mind , The best flash player available free of cost for all web browsers. it can play videos in youtube and flash games or any other flash content on the web. In upcoming few years, we may not need any flash player because of the new features of HTML 5.0 , but currently all browsers do not support it well, specially Firefox and Internet Explorer. #1 : Download the *.deb (short for Debian) package for your system. #2 : Open the saved file with Ubuntu Software Center or use dpkg to install it from command line (Enter login password when prompted). #3 : That’s All ..Now restart the Firefox browser and enjoy videos and flash content over the web. Go to menu located in Top Left corner and search for ‘Ubuntu Software Center’. Now open Ubuntu Software Center and search for “adobe flash” and install it in a single click But above method is better if you want to install latest version or install it from synaptic package manager (don’t forget to click on reload button in the beginning itself, for latest information regarding the packages). The process is quite simple – search for ‘adobe flash’ and mark the box for installation which says – ‘Adobe Flash Plugin’ ; Now click on Apply button to install the selected package(s).